It’s still too early to tell if we’re going to suffer another PDAC Curse this year. Things are still positive, but not strongly so. Certainly not positive enough to give the junior sector a broad-based lift. The good news is still selective, as are the gains. Luckily, at least some of those gains are being generated by companies on the HRA list which are updated within. Hell if I know. If you're a resource investor, you know what I'm talking about. The infamous "PDAC curse". It's the bane of resource investors everywhere, striking fear into their hearts as the ides of March approach. Truth is, its usually a smart money move to assume a pullback heading into late March and again in late May. The chart below shows a 13 year history of the TSXV. You can see from the ovals that I added to it that there are really only two years where we didn't see a drop after March. It should be noted that there are a couple of years where things flatlined, so selling in March was a tossup. There is also 2011, when selling in March would have felt fairly clever for about two months, then very, very stupid afterwards. Any way you slice it, it's a pretty one-sided record. It's easy to see why the "PDAC curse" is an urban legend. Like many urban legends, it contains more than a grain of truth. 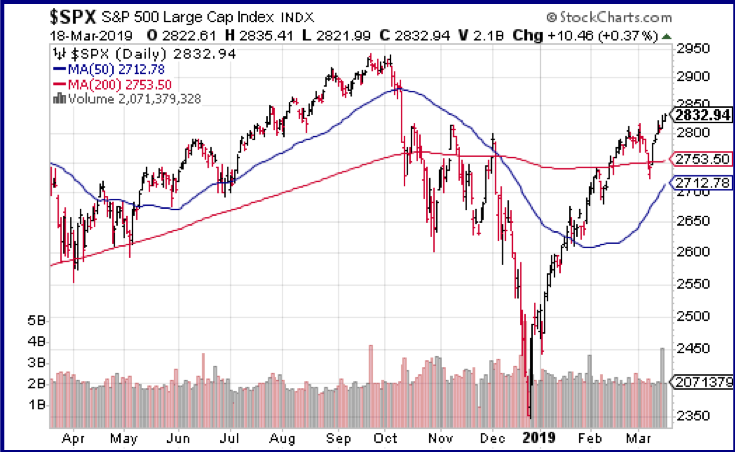 I think it's still too early to tell which way this year will go, though it's fair to say hopes will dim if we don't see a sizable rally fairly soon. After an auspicious start to the year, the Venture Index has basically flatlined since the beginning of February. Personally, I'd like to see the TSXV at least five percent higher in the next 2-3 weeks to give me some real comfort that it won't be another one of those years. Part of the reason for the almost annual bout of weakness is simply lack of news. Companies get whatever news out they can before/at PDAC to try and get some attention. In many cases, there is nothing in the news hopper afterward and the company goes quiet for a couple of months. It may be sacrilege to say it, but I think many companies worry too much about getting PDAC news out. Industry types are mesmerized by attendance numbers in the mid-20k range but, the truth is, only a tiny percentage of those attendees are traders. Most are middle management, bureaucrats and geology students looking for jobs. Yes, it's a good place to release news if you're looking for a JV partner or you have something truly significant. Even so, I've never viewed PDAC as much of a "marketing" conference. There are a huge number of companies in attendance but the vast majority are also-rans. It's got the lowest booth cost of any major conference and is a great place to meet old classmates or coworkers. That is the biggest attractions for many. Well, that and the free booze to be found at scores of hosted events if you can wrangle tickets. Frankly, walking through the booth area this year, the main thought that came to me was "huh, I thought that deal delisted or moved into weed years ago". Companies that don't really have much going on can get some attention around PDAC, but it tends to fade quickly. Many of those companies aren't TSXV Index members but some are and they help to drag the index lower post-PDAC most years. I expect that effect again this year, but we may get enough better news from higher cap index members to overcome that. (Note, as always, that a large part of the index is non-resource companies these days. A couple of strong months for weed stocks could counteract the PDAC Curse at the TSXV Index level, even if resource stocks themselves are lacklustre). There have been some out-performers like Great Bear and Westhaven that are helping the Index hold up. If Discovery companies keep delivering this will help a lot. At the end of the day though, its really about the gold price. As noted in the last issue, base metals have turned around in the past couple of months. That better trend continues, particularly for copper and zinc. That may help the index, but only marginally. Except for a handful of (mainly copper) explorers and developers most base metal juniors are still in a funk. It's just difficult for base metal juniors to hold trader's attention the way gold deals do unless a given base metal is rocketing in price. There simply aren't enough base metal explorers for them to have the overall, sustained impact on the index that gold can. Gold, of course, took a nose dive just as the PDAC was about to kick off this year. Cynics surely felt vindicated as bullion dropped from the $1350 area all the way back to $1280. Gold managed to bottom there however, and has since fought its way back to the $1300 level. I wouldn't say gold is trading "well" at the moment, but it's at least encouraging that it came out of its dive. Continued Fed dovishness, or assumed dovishness at least, continues to drive yields lower after they peaked in Q4. The 10-year yield is off 60 basis points since November. 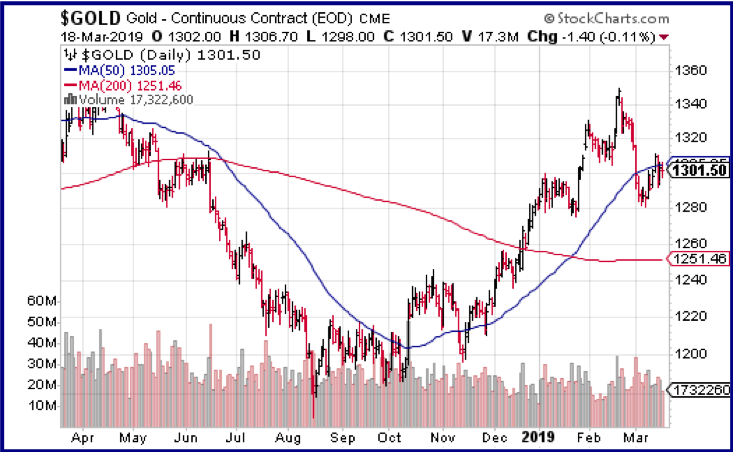 That has been a major support for gold, though it hasn't been enough yet for gold to break convincingly higher from the $1300 level. While there have been encouraging signs, like higher central bank buying, gold is still widely viewed as a "risk off" asset. And the last couple of months has most definitely not been a risk off period on Wall St. The second chart below traces the relentless move of the SPX since it bottomed in late December. With the exception of one pretty minor pullback at the start of March its been straight up. It seems like nothing can slow the advance and traders have gone from worrying about a new bear market to calling for new all-time highs in the space of a few weeks. The minor drop at the start of this month can be traced to a series of poor economic readings, culminating in a US non-farm payroll report for February that came in WAY below consensus. Normally, a 160k miss on a payroll report, accompanied by a slew of weak readings from forward-looking metrics would have a more lasting effect on the equity market. Not this year. Lower yields have saved the day here too. Traders are now expecting the next move by the US Federal Reserve to be a cut, not an increase. That is buoying stocks, at least for now. It seems that no one is thinking about the conditions that would have to exist for the Fed to cut. That's tomorrow's problem, but how long does that last. I've expected a US recession starting in 2019 since the start of the year. Aside from lower rates themselves, there has been little incoming data to move me off that stance. And I'm starting to get some company as other market commentators pull their recession start estimates closer to the present day. 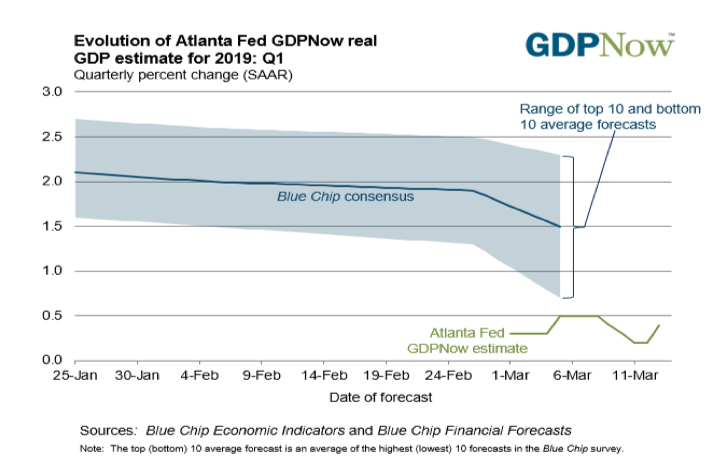 The chart below shows the current reading for the Atlanta Fed's GDPNow. This measure is far from perfect-all economic forecasting metrics are-but its generated a pretty good track record over the last 2-3 years. You can see how far below current Wall St consensus the GDPNow reading is. Wall St has shifted its estimate for Q1 growth down to 1.5%, but that's still three times the current GDPNow estimate of 0.5% growth. I wasn't assuming a recession start this early in the year. While I feel somewhat vindicated by the GDPNow reading, it's still calling for growth this quarter. And bulls can point out, correctly, that the US has a recent tendency for Q1 dips in the growth rate. I think its Q3 or Q4 when we could see GSP turn negative. While I think a recession starts this year in the US, I also think it would be quite mild. I don't see a big obvious catalyst for a long and deep recession. And getting by with a mild, two quarter recession after 10 years of expansion would be pretty impressive. Could we get by with a mild recession and no bear market on Wall St? Nothing seems to faze traders right now. The prospect of the Fed stopping rate increases and even cutting rates has traders mesmerized and on the bid constantly. Maybe we do get new highs, but I doubt it. There has never been even a mild US recession without at least a 20% drop on Wall St. I don't see why "this time is different". If I'm right about the US experiencing recessionary conditions, we should also see a stronger gold market later in the year. 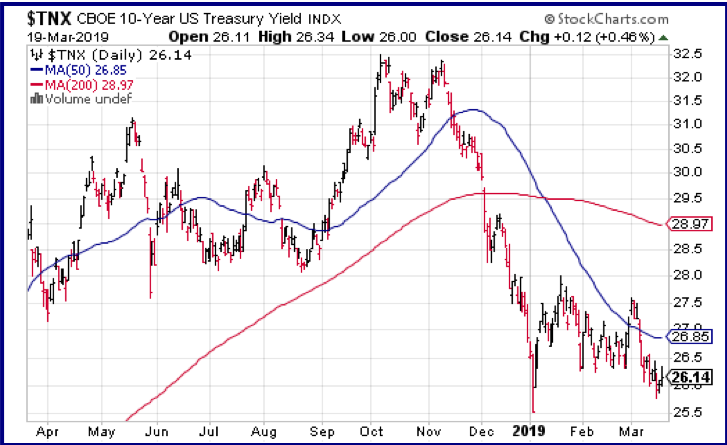 Real interest rates should fall further and, probably, so would the US Dollar. That combination should be enough for gold to finally break above the $1350-1370 range. What we don't know is whether that move starts soon enough to avoid the PDA Curse. We've dodged the bullet so far, but we need to see an up leg in the juniors-soon- before even thinking of sounding the all clear. The SPX is only about 5% below its all time high. Higher gold prices don't require Wall St to drop, but it could accelerate a move. If November was the top for Wall St, we'll see a rollover within a couple of weeks. That would fit the timeline to keep the junior rally alive if its not too steep a drop. I'm still betting that we dodge the "curse" this year, but we should have a definitive answer by early April.